Carter Randklev's top shelf wrist shot with 26 seconds left pushed the Spuds past the Cougars. 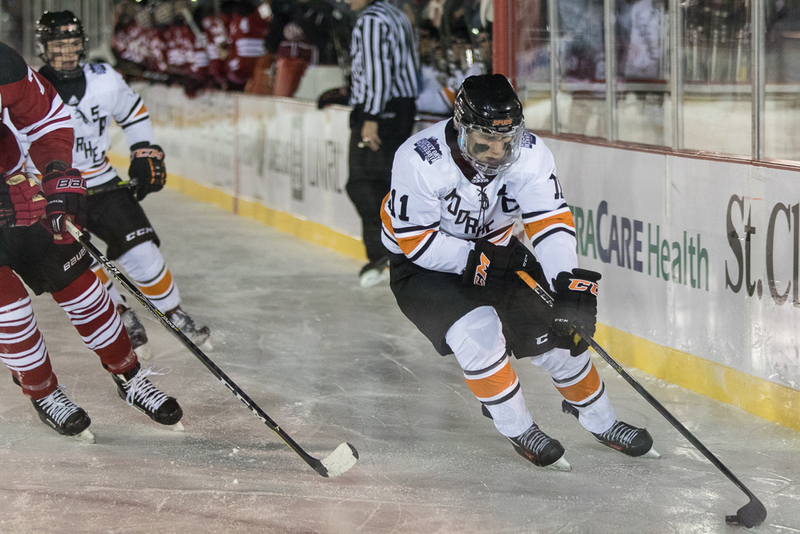 Carter Randklev felt a sense of urgency creeping up on him in overtime of Moorhead's game against Centennial on Saturday night. The senior's teammates felt it too. After surrendering a two-goal lead in the second period, the Spuds were forced to hammer away on net with twice as many shots as the Cougars -- but left with little to show for it. When finally given the chance to do something about it, Randklev seized the moment. With 26 seconds remaining in overtime, Randklev’s top-shelf wrist shot found the back of the net and lifted Moorhead to a 3-2 victory over Centennial at Lake George in St. Cloud. It was a memorable close to an unforgettable day. Moorhead raced out early with two first-period goals -- one from Cole O’Connell four minutes in and another a short time later by teammate Kyler Kleven. But Moorhead (13-6-0, 3-3-0) took a step back in the second period, allowing two special teams goals (one shorthanded and another on the power play) that let Centennial (10-4-3, 4-1-2) hang around and threaten to spoil the Spuds’ effort. A scoreless third period pushed for the extra session, where Moorhead, ranked No. 13 in the Class 2A coaches’ poll, found its footing and tipped things in its favor. Senior forward Jack Stetz retrieved the puck from the corner in the waning seconds and delivered a well-placed centering pass that set up Randklev. Stetz said the Spuds felt it was only a matter of time before the weight of the offensive pressure would break through to reward Moorhead. 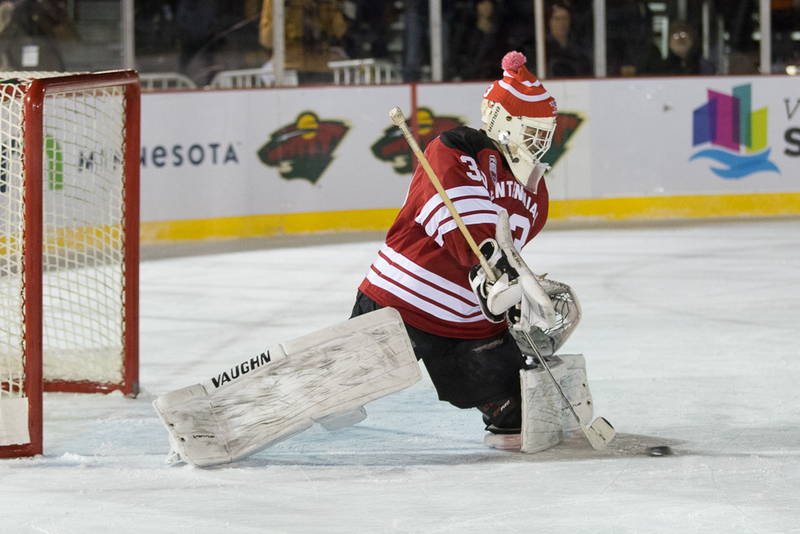 This was Moorhead's second time participating in Hockey Day Minnesota, having hosted it in 2011. Many of the current Spuds were in attendance seven years ago, including O’Connell, then a fifth-grader who dreamed of taking part in the experience. The trip to St. Cloud for this year's event was all he hoped it would be. After the game, live music emanated from the winter garden just beyond the east end of the rink as Moorhead took its time leaving the ice while posing for photos with friends and family. The Spuds soaked it all in. Ammerman hopes this victory, only the Spuds' third against a Class 2A foe since the new year, can jumpstart his team toward a section run after some early January stumbles. 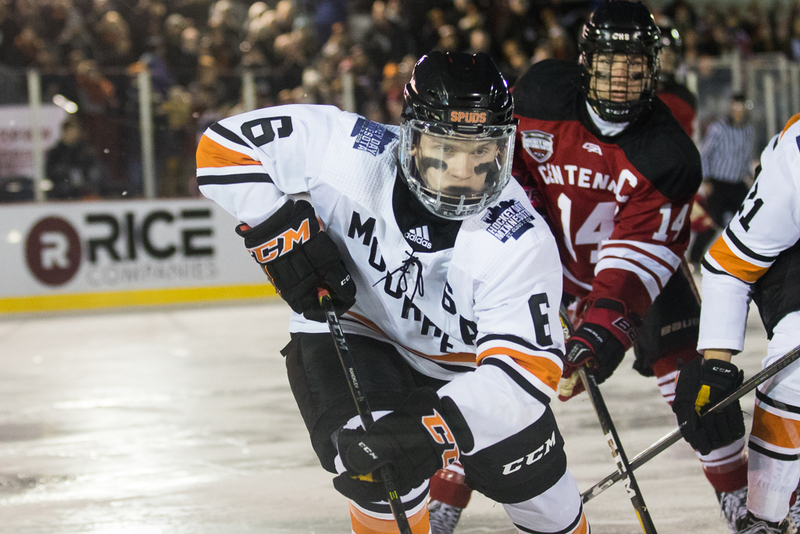 Carter Randklev’s top shelf wrist shot with 26 seconds left in overtime lifted Moorhead to a 3-2 victory over Centennial in the matinee of Saturday's Hockey Day Minnesota event at Lake George in St. Cloud. The Spuds, ranked No. 13 in the Class 2A coaches’ poll, outshot No. 8-2A Centennial for most the way, but were left without much to show for it until Randklev’s game-winner. Cole O’Connell got the scoring started for Moorhead (13-6-0, 3-3-0) a little more than four minutes in, and six minutes later, the Spuds added to their lead with a goal by Kyler Kleven. The Cougars (10-4-3, 4-1-2) leveled things with two special teams goals in the second period -- a shorthanded goal from William Francis less than three minutes in and a power-play goal by Hayden Brickner midway through the period. After a scoreless third period and an almost equally empty extra session, Randklev converted on a centering pass from teammate Jack Stetz in the waning seconds to secure the victory for the Spuds. Lance Leonard earned the win between the pipes for Moorhead, stopping 20 of the 22 shots he faced. Centennial split goaltending as Travis Allen made 13 saves on 15 shots he faced over the first period and a half, and Bryce Crowley made 22 saves on 23 shots.